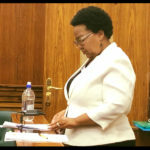 UNDER cross examination from the state Education Minister, Katrina Hanse-Himarwa who testified in the High Court in her own defence stated that she had no mandate to scrutinise possible changes to the mass housing list. Deputy Prosecutor General Ed Marondedze is set to wrap up its cross-examination of the accused person today. The minister confidently told the court that it was up to the administrative office to investigate these issues. Marondedze then put it to her that she took a conscious decision as a leader not to look into the allegations because she willingly edited the beneficiary list and had full knowledge of the action. The State Prosecutor continued to grill the minister, who has enjoyed, since the start of her trial, a strong support base in the court’s galley that consists mainly of politicians and family. If the cross examination is concluded today counsel for the defence has indicated it might still call additional witnesses to testify in defence of the minister. If no other witnesses are called by the defence, the court will proceed to ask for final submissions before judgement is made on whether or not Hanse-Himarwa is guilty on the charges of corruption.